Don’t spend Black Friday frantically running around the supermarkets, trying to avoid people who are jumping over television and games consoles in an attempt to get the ‘best deal’. If you’re after Rattan garden furniture, for your back garden, decking or even your conservatory we’ve got loads to choose from. Our BLACK FRIDAY page has a variety of offers and I’ve picked out the best ones, so you can get cheap Rattan furniture, so your summer hols will be flying before the New Year even begins! Last summer was great, wasn’t it? The sun was constantly beaming down on the UK and for what felt like months we were living in a British paradise. Why not enjoy next summer in style…This Cambridge black rattan set features six chairs, so you’ll be able to relax in the sun in comfort when the weather begins to heat up. Pop a cold drink, with plenty of ice on top of the round glass table. Not only is this chair in our Black Friday sale, but it also comes with a FREE parasol, so you’ll be able to sit outside, in the shade when the British summer time arrives. 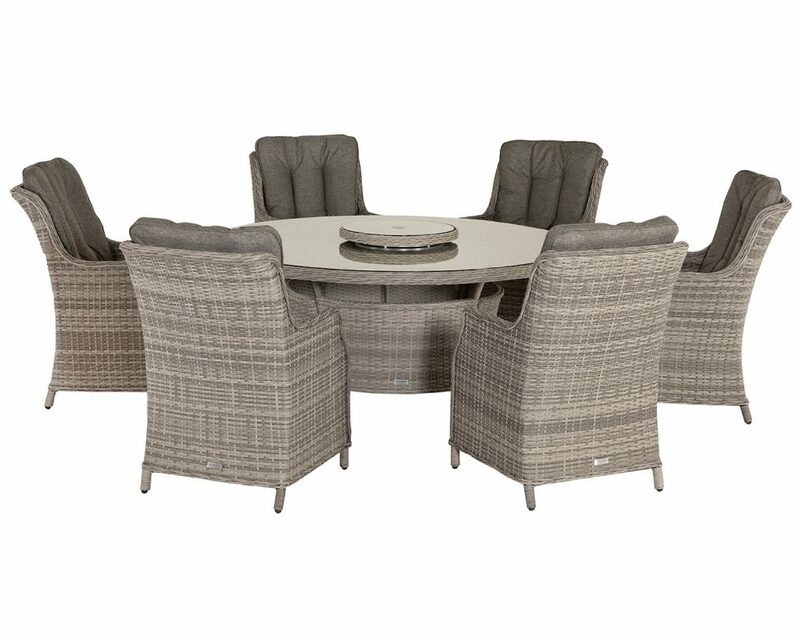 The Riviera range boasts a stylish design with comfortable cushions, so you’ll be dining al fresco when the sun begins to shine. The best large outdoor dining table is from our Riviera range. The large dining table has a bevelled glass top and even space to put a garden parasol. All of the chairs are fully woven with showerproof cushions so even when the (slim chance) of rain begins to pour, your cushions won’t get ruined. This set is in the Black Friday 2018 sale, making this the best grey rattan furniture set deal. Bring the Valencia range to your back garden, creating the luxury setting you desperately need. The black and vanilla colourway looks stunning in the sun. The curved ottoman is the ideal place to put your feet up and relax. The round coffee table offers the perfect space to place your drink on. This set is incredibly versatile, with it coming in seven pieces you can arrange it however you wish, so whether your garden is big or small you can arrange this set any way you wish. Our last pick is from our Florida range. The chocolate and cream colourway will look great in either your garden or conservatory! The set comes in six pieces including the square bevelled glass coffee table. There’s plenty of room to kick back whilst enjoying the sunny weather. Create the picture-perfect garden that you have dreamed of, where you’ll be able to unwind in a luxury setting. You can lie down in your garden, whilst the sun beams down on you on this Venice day bed. The circular base is made up of two parts, so you can either lie down or put your drink on the glass bevelled top coffee table. This daybed has a canopy above it, so you can enjoy the sun, and be protected from the shade. If you’re wondering what you can do with the daybed over the winter months, you leave it outside until a sunny day arrives, as it is rust protected. So, if you want to bring the Ibiza look, to your own back garden then our rattan day bed that features in our Black Friday 2018 sale. All of these sets are in our Black Friday rattan sale where you’ll be able to find the best outdoor furniture at fantastic prices. There are free scatter cushions, parasols and you can save up to 50% off some products. So, come and shop our Black Friday deals the stress freeway at Rattan Direct. View all of our sale items by clicking here.